Miss Chloe Messer of Samson passed away on Wednesday, May 9, 2018. She was eight years old. Funeral services will be held at 3:00 p.m. on Saturday, May 12, 2018, at Lime Springs United Methodist Church with Rev. Phillip Barnes, officiating. Burial will follow at Oak Ridge Church of Christ Cemetery with Pittman Funeral Home of Samson directing. The family will receive friends prior to the service on Saturday beginning at 1:00 p.m.
Chloe had a beautiful smile. She loved music and loved watching her sister dance. 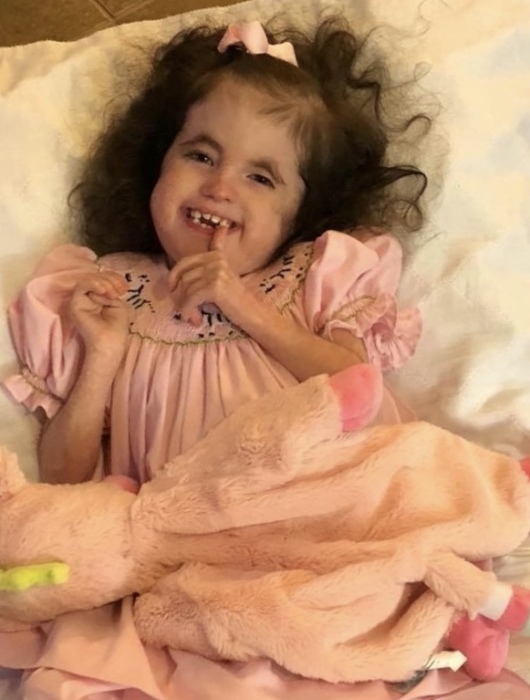 She blessed others and was like a celebrity in the Trisomy world, having long outlived the typical lifespan of someone born with Edwards syndrome. She had strength many could only hope for. She never knew heartache or bad. She only knew love. Chloe was an angel on Earth, now she’s an angel in Heaven. She was preceded in death by her maternal grandmother, Julia Adcock. She is survived by her mother, Beth Carr (Steve); father, Brian Messer, all of Samson; maternal grandfather, Travis Marsh of Geneva; paternal grandparents, Sam and Laura Messer of Samson; brother, Andrew Sammons of Enterprise; two sisters, Jenni Boorda of Colorado Springs, CO and Sydni Messer of Samson; and nephew, Conner Boorda of Colorado Springs.